A weak outlook for the fourth quarter sent the shares tumbling last month. Shares of Texas Instruments (NASDAQ:TXN) declined 13.5% in October, according to data provided by S&P Global Market Intelligence. For perspective, the S&P 500 was down 6.91%. The stock was in positive territory year to date through the month of August, but it started to fall along with the broader market in September. The stock's decline began to snowball after management issued weak guidance during the company's third-quarter earnings report in late October. Texas Instruments' reported solid third-quarter operating results. Revenue met expectations, growing 4% year over year to $4.3 billion. Earnings per share beat Wall Street's expectations by surging 25% to $1.58 per share. However, management's fourth-quarter guidance of revenue between $3.6 billion to $3.9 billion was lower than the $4 billion analysts were expecting. Investors didn't like the sound of that, which sent the shares down 8.22% immediately following the news. Vice President David Pahl said, "demand for our products slowed across most markets during the quarter." Pahl attributed weak demand to the broader semiconductor market slowing down after several years of growth. 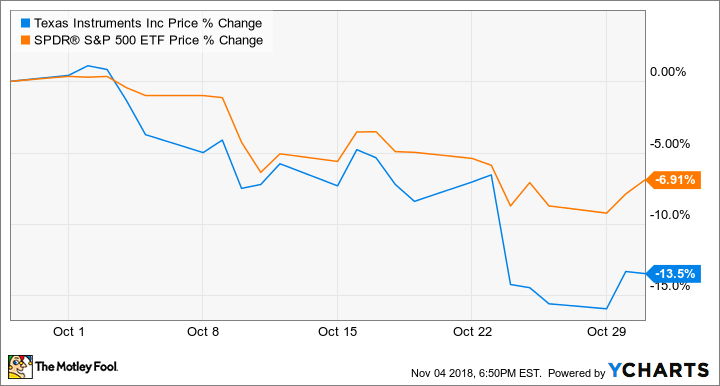 Other companies in the industry, such as Advanced Micro Devices (NASDAQ:AMD) and Cypress Semiconductor (NASDAQ:CY), also reported weakness in demand, while Intel (NASDAQ:INTC) showed strength in its latest quarter. The Philadelphia semiconductor index has soared 147% over the last five years, which is well ahead of the S&P 500's return of 54%. Texas Instruments and other chip makers have seen booming demand for processors from the automotive and industrial markets in recent years, driving those impressive gains. The performance of semiconductor companies is seen as a forward indicator for how the broader economy is performing since processors are used in several industries across consumer electronics, mobile devices, home appliances, cars, factories, and many other applications. This is one reason investors were so quick to bail on shares of Texas Instruments after it gave a weak outlook. Intel's strong quarter seemed to ease concerns for the time being, with most chip stocks rebounding since Intel reported its results in late October. It's possible that Texas Instruments may just be experiencing a temporary slowdown before demand picks up again. It's also worth noting that the uncertainty surrounding the mid-term elections may have something to do with weakening demand in the short term. We'll know more when Texas Instruments reports its fourth-quarter earnings early next year.